The Ancestry.com mobile app is available for iPad, iPhone, Android, and Windows 8 and Windows RT. If you’re one of those people who are always on the go, you can use a genealogical app instead of a standard genealogical database on your computer or an online family tree. App is short for application, and typically can run on your smartphone or tablet. Several apps on the market are free companions to genealogical software packages such as RootsMagic and Legacy Mobile, and there are some paid companion packages such as Reunion. Perhaps the most flexible is the Ancestry.com line of products that allow users to integrate the Family Tree Maker software with the Ancestry.com online family tree and the Ancestry.com mobile app. 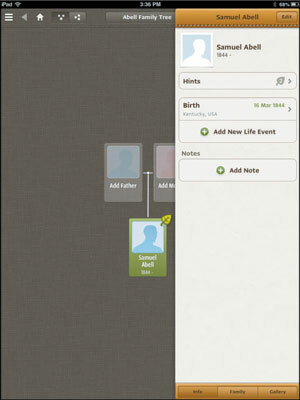 With the free Ancestry.com mobile app, you can build a new family tree directly in the app or you can link to an online family tree that you’ve already started on Ancestry.com. Plus, if you’re a subscriber, you can integrate the three products with the subscription content, including Ancestry.com’s vast collection of digitized primary sources. 1Turn on your iPad and locate the Ancestry.com mobile app icon. The icon has a brown background (shaped like a book) with a two green leaves against the Ancestry.com logo. If you haven’t downloaded and installed the app on your iPad before, use the instructions that came with the device to find and download the app from the iTunes App Store. 2Tap the Ancestry.com mobile app once. The first time that you access the app, a special landing page is displayed. The page contains instructions for creating a family tree beginning with yourself. Alternatively, if you started an online family tree using the steps in the previous section, you can click the Member Sign In drop-down box at the top of the screen to locate it. You need to know your user name and password to complete the login process. 3Tap the Add Yourself icon. Assume you’re starting a new family tree. Tapping the Add Yourself icon launches a Tell Us about Yourself pop-over box. 4Tap the First Name and Last Name fields and enter your name. You can also tap the button for your gender and, if you’re feeling adventurous, tap the photo icon to add a picture. 5Tap the Add button in the upper-right corner of the pop-over box. After a few seconds of processing, a two-generation Pedigree chart appears. Your information is in the bottom box, and space for your parents is just above that. 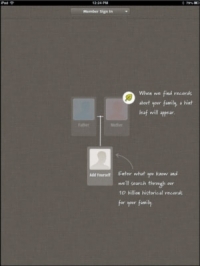 The onscreen text shows the button to tap to create an Ancestry.com account to store your family tree. 6Tap the Save Family Tree button. The Save Family Tree pop-over box appears. 7To create a new account, enter your e-mail address and password. If you aren’t interested in receiving e-mail tips and offers, tap that box to deselect the option. 8Tap the Create Account button at the top-right corner of the pop-over box. After a little processing time, a pop-over box should appear with your name on it. 9Tap the Add New Life Event button. The Add Event pop-over box appears. With this box you can add information about yourself. Perhaps start with your birth. 10Fill in the information about the event by tapping the Choose Type, Choose Date, Choose Location, and Description buttons. In the example, tap Type and selected Birth. Then tap Date and use the date wheel to set the date to March 16, 1844, and the location to Kentucky, USA. Note that when you begin typing the location, the app will try to give you standard place names to select. Each time that you complete another pop-over screen, such as the date wheel, tap the Done button. The app saves the record and adds the event to the person window. When you add the event, if you entered information on someone that Ancestry.com has a match for, you see a green leaf appear in the Hints area of the window. Repeat Steps 9 through 11 to add more events. If you’re interested in seeing what Ancestry.com found related to the individual, tap the Hints button. The person window is replaced with the Hints window showing any content that it believes is relevant to the person. 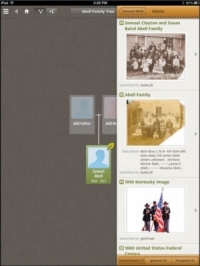 In our case, it shows some pictures that were contributed by other Ancestry.com users and references to digitized primary sources on the subscription site. If you have an Ancestry.com subscription, you can select a Hint and attach it to your person, if you believe it’s relevant. 13Tap the button containing the person's name to return to the person window. The button is typically labeled as the name of the person you’re viewing. It’s located in the upper-left corner of the Hints window. 14To add information about family members, tap the Family button at the bottom of the person window. Tap the Add Family Member button and a list of member types appears: Add Parent, Add Spouse, Add Child, and Add Sibling. Tap the appropriate family member type and complete the Add pop-over box. 15To add another person on the family tree, tap an area outside of the person window and tap the Add Father or Add Mother icon. The person window slides away when you tap an area outside of the window.